Yesterday was a wasted day for me, as I partied a little too hard on Friday night. I feel fresher today though and ready to give this new album a spin from Belorussian progressive metal band Irreversible Mechanism. It's still fresh, as it was only released just over a week ago by Blood Music. It's the band's second release following their 2015 debut "Infinite Fields". 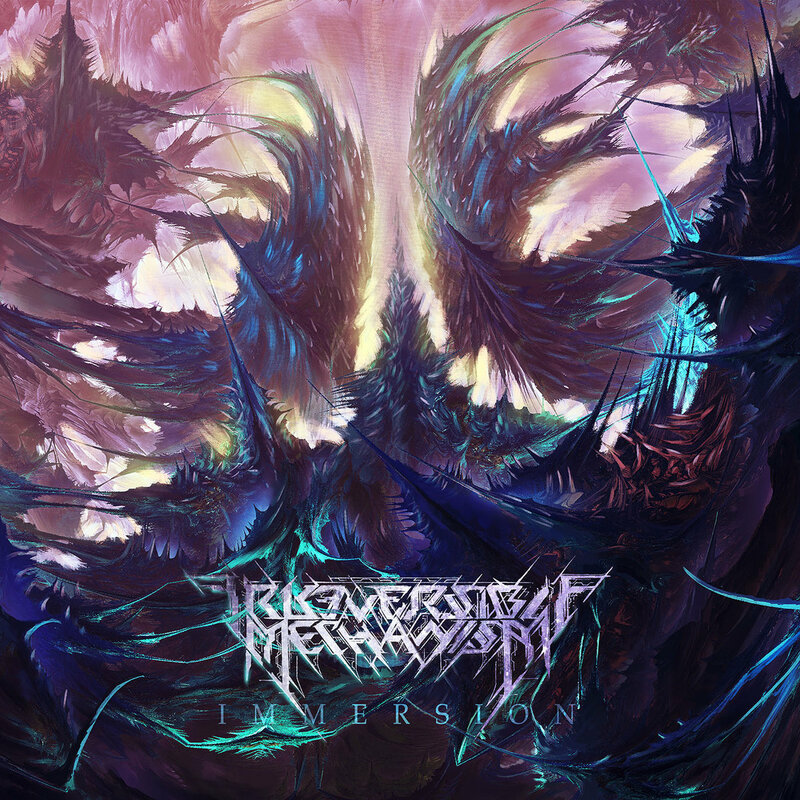 You can buy "Immersion" now on cd, double LP and digitally. Progressive/Technical death metal always promises a lot, but I often feel a bit underwhelmed after listening to it. I’ve never quite understood why that is, but it could be down to my musical tastes altering as I get older. I’m hoping Irreversible Mechanism will be different but as opening track Existence I: Contemplation starts with ambient synths that make up half of the song, I’m still not convinced. When the second half of the song sees the band open up more, there's a glimpse of what’s to come with a brief hit of their extremity and some very good musicianship that leads to a classy solo. Existence II: Collision is more like it. The band launches straight into it with on unnecessary build-up and immediately shows off their musically ability. The good thing about it is that even with the frenetic drumming and guitar-work, the pace seems to be at the right end of the spectrum enjoyment wise. The mix of harsh roars and clean singing also works really well. As with many bands that perform with progression in mind, the songs on “Immersion” are lengthy. Abolution stretches to nearly six-and-a-half-minutes and as the album title suggests, it requires your full attention. I think what sets Irreversible Mechanism apart as they progress is their ability to play with sensitivity as well as aggression, and being able to inject variation into their music. Pleasantly surprised at the moment. They revert back to a more electronic/ambient sound on Simulacra. The organ gives it a sinister edge and the otherworldly electronic effects are well placed. The noise level builds in layers as more effects and vocals come into play, moving the song from being what could have been a lengthy interlude and turning into something more. There’s a real sense of purpose about Footprints In The Sand. Again it’s main verse is preceded by a lengthy instrumental build-up but when it gets going properly, it again highlights the band’s agility and brutality. It’s the standout track on the album for em due to it’s different movements and melody. The second half of the album it stronger and more focused with Beyond being easily the heaviest piece so far. It’s tempo also raises up a few notches for good measure. Limbo follows and that title is quite apt, because it’s calming music and short playing time sort of leaves you in limbo following the intensity of Beyond. It does contain another solid piece of guitar virtuosity though. Limbo flows into the title-track perfectly and what follows is another barrage of kick-drumming and mind-bending riffs. There’s a lot to like on this record and despite my earlier uncertainty, this album is certainly growing on me. Closing track Awakening ends the album on the right note. Irreversible Mechanism have written an album that’s full of ideas, creativity and stellar musicianship. A lot of album of this ilk tend to sound too clinical in the production/mastering and while “Immersion” sounds clean and clear, it’s certainly not over-produced and It allows the band to give a great account of themselves. "Immersion" is available to buy digitally and on cd (a limited quantity is still available) from the bandcamp page above and vinyl copies can be purchased here - https://www.blood-music.com/store-eu/irreversible-mechanism.